LAKE FOREST, California – John “Jack” Caldwell, a pioneer in the automotive repair industry, has died at the age of 85. Mr. Caldwell, who passed away Saturday, spent many years on the Automotive Service Association’s Operations Committee, ascending to Collision Division chairman. “He was a pioneer with his passion for the industry and truly enjoyed being involved,” said Kevin Caldwell, a past chairman of ASA and one of Jack Caldwell’s three children. 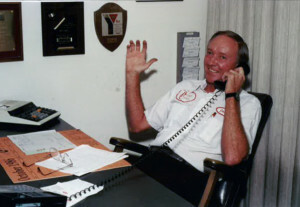 Mr. Caldwell also served as NACE chairman in 1988 and 1989, while his son Kevin served in that capacity in 1998, 1999 and 2000, making them the only father-son to ever accomplish that feat. Services for Mr. Caldwell will be Friday, Feb. 8, 2019 at El Toro Cemetery in Lake Forest, California, where he lived for the past 50 years. In addition to his three children – Kevin, Kerry and Kelly, Mr. Caldwell is survived by six grandchildren and five great-grandchildren. Born in Cleveland, Ohio on April 14, 1933, Mr. Caldwell moved to California nine years later. Continue reading about Caldwell in AutoInc. Magazine by clicking here.